If you are a beginning teacher, your resume should not be more than one page. If you have two or more years of experience, you may have a longer resume to detail your work experience. Identification : Include your name, address, phone and email address. Your name should have a larger font size as compared to the other text. Certification : List your certifications and any endorsements, and the date. For example: 'Illinois Initial Secondary Certificate in Mathematics, expected December 2001. Endorsement expected in Middle Grade Mathematics'. Once you have your certificate, delete the date and list the certificate number instead, for instance : #1234567. Teaching Experience : Use the list of action verbs located on the left of this page to describe your experiences in the classroom. They specially like to read about your classroom management skills/strategies, the teaching methods you use, any experience with students with special needs, and the interactions with their parents. Include job title, where you worked as a teacher, along with tenure dates. Related Experience : This is where you list paid or unpaid work which gave you all your experiences. You can also list science or math related employment in this section. The rest of your teacher resume can include any of the following elements. Again, choose those which sell you best as a teacher. Work experience not related to teaching, science or math : This element is optional because your teaching experience is what interests principals and other hiring authorities the most. List these jobs in reverse chronological order. Career Objective : This is a statement of what kind of job you're seeking. 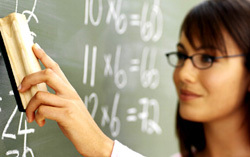 Example: 'To obtain a Math teacher's position in a secondary school'. Don't get too flowery or trite. E.g. 'seeking a challenging position' - aren't all teaching jobs challenging? Honors and Activities : If you have some impressive honors (Dean's list, Phi Delta Kappa, any scholarships or achievement awards), or activities which relate to teaching, you can list them. Special Skills : Fluency or proficiency in foreign languages, use of advanced calculators or mathematics software, etc. Professional Preparation/Development : Special workshops, seminars etc. that you've attended. Professional Memberships : List those professional associations to which you belong. Include any leadership position or committee memberships. E.g. National Science Teachers Association. Your uniqueness as a teacher or your positive trends as a teacher. Techniques developed to teach a particular lesson. Contribution to any special event for the class/entire school. Listed below are the sample teacher's resumes. You can choose any one of these sample teacher's resume templates. Remember, your resume will only get a few seconds attention, at best! You have to generate interest right away, in the first sentence they lay their eyes on. Having an objective statement that really sizzles is highly effective.